Sally nervously prepares for her trial. Paula isn’t happy about her antics with Abi and warns her she may have to tell the prosecution. Sally takes the stand and protests her innocence telling the judge and jury that she never had an affair, never stole any money and loves her husband dearly. The time comes for Gina to take the witness stand will she come through for Sally? Mary is encouraged when a man called Darren contacts the Find Jude campaign and says he saw Jude in Withington. Elsewhere, Cathy is concerned as Phil continues to pile the pressure on Brian who has stayed up all night working on the play and causing him to miss a staff meeting. Phil orders him to work late to make up for it and questions whether he has what it takes to be a teacher after all. Meanwhile Kate and Rana are shocked to discover the first round of IVF will cost £3500. Rita slips and twists her ankle outside the Rovers where Jenny was mopping the flags. Rita asks Cathy to look after the Kabin and moves into the Rovers to recover. The prosecution sum up their case describing Sally as morally corrupt and indisputably guilty. Paula does her best to show that Sally was innocently taken in by Duncan’s devious lies. Who will the jury believe? Angie and Mary attend the mortuary to ID the body. When Rita tells Johnny that she wishes she had a child of her own it starts Johnny thinking. He tells Kate and Rana he will pay for their IUI treatment. Kate is thrilled but is Rana? With Johnny as the compère, the pub quiz takes place. Brian’s put out when he’s pipped at the post by Roy’s team. Having clocked Johnny and Liz exchanging a warm smile, Jenny’s immediately suspicious and surreptitiously scrolls through Liz’s phone looking for incriminating texts between them, but finds nothing. Having listened to the evidence Tim is once more of the belief that Sally may have had an affair. Sally is devastated. Meanwhile Paula ends it with Sophie. Kate and Rana attend the fertility clinic. Kate’s giddy with excitement whilst Rana does her best to appear enthusiastic. Kate and Rana agree between them that Kate will carry their baby. Kate’s thrilled and tells Rana she can’t wait to be pregnant. Jenny secretly puts Liz’s phone in water. When Liz realises it isn’t working Jenny says she is due an upgrade and offers Liz her old phone. What is she up to? After a successful physio session, Jack announces that he wants to do some fundraising for the hospital. Kevin’s proud of his son. Jack reveals his one-legged race fundraiser idea to Greg. Greg offers his full support. 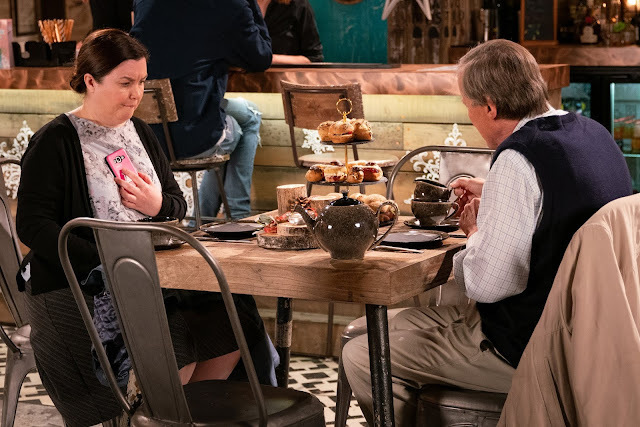 Aware that Robert is desperate to have a baby with her, Michelle suggests they take the afternoon off by way of a treat. When Angie explains that she’s changed the locks at No.3 as she needs to move on, Mary’s upset and vows to continue her search for Jude alone. Tim confides in Gina that he feels an idiot believing Sally didn’t have an affair. Sally tells Gina she can’t bear the thought of her husband thinking she is a liar. Battling her emotions Gina tells Tim she is moving out but Tim tells her he wants her to stay. Kate excitedly fills Johnny in on their trip to the clinic. 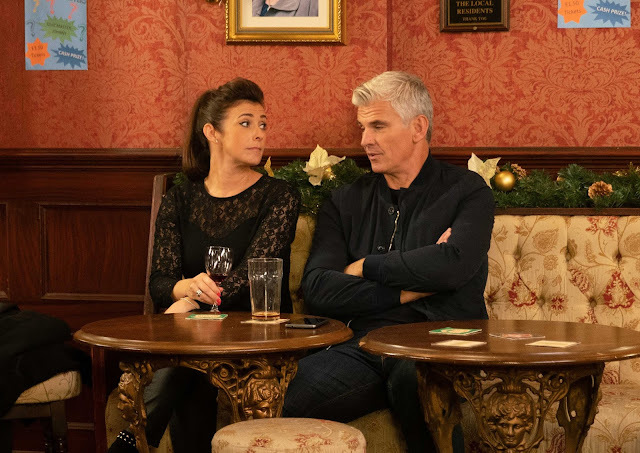 Johnny’s thrilled at the prospect of another grandchild and Rana masks her anxiety. 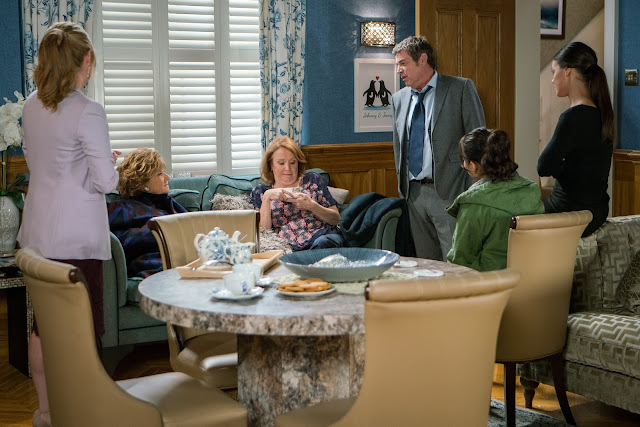 Rana bites the bullet and admits to Kate that she’s not happy at the idea of a complete stranger fathering their baby. Kate’s stunned. Michelle tentatively asks Robert if all Kate’s talk of babies has made him broody again. Robert covers and assures her he’s over it. Johnny is sick of Rita being in the Rovers living room and says he is going to the Bistro for some peace and quiet. When Jenny sees on her app that Liz is also at the Bistro her suspicions are aroused. She bursts into the bistro - what will she find. Jack calls in the corner shop and asks Dev if he’d like to sponsor the one-legged race fundraiser for the hospital. Under pressure from Evelyn, Dev agrees to donate £200. Roy treats Mary to afternoon tea in the bistro to celebrate Jude’s birthday and cheer her up. Mary paints on a smile as she surreptitiously reads an incoming text. 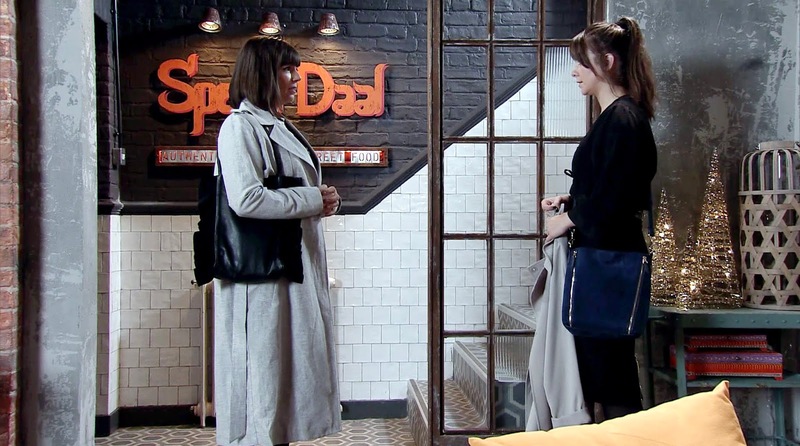 Kate stuns Rana by bursting into the medical centre and suggesting they should adopt a baby instead. Angry at being hijacked a work she orders her to leave. 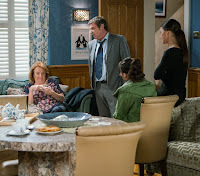 As Kate drowns her sorrows she drunkenly suggests to Robert that he could father a baby for her and Rana. Evelyn begrudgingly agrees to babysit but calls Hope a naughty girl who doesn’t deserve any treats. 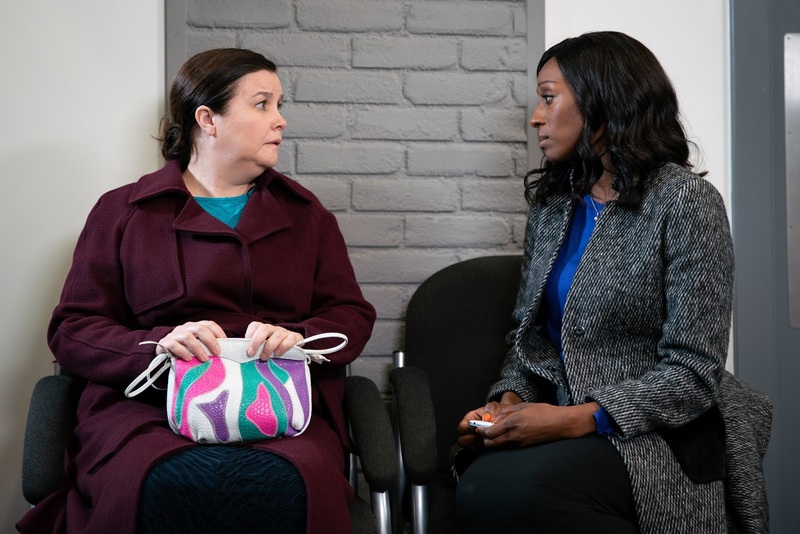 When Hope throws Evelyn’s jigsaw on the floor it is the last straw and Evelyn tells Rita that she has no time for Hope and Ruby is her favourite. Fiz and Tyrone are shocked when they return home to find Evelyn threatening Hope. Gina lies to Sally making out Tim doesn’t want to talk to her. When Sophie offers to talk him round, Gina’s quick to stamp on her plan. Sophie finds Tim and Geoff in the cafe. When she tells Tim how desperate Sally is to speak to him, Tim’s confused and admits that Gina told him quite the opposite. Finally, Kevin blames Greg when Jack falls and hurts himself during the sponsored one legged race. Rita is glad to be back behind the counter at the Kabin. Robert tells Kate her idea is crazy and sends her packing. But will he change his mind? Telling her she’s gone too far this time and he has to put Fiz and the girls first, Tyrone insists that it’s time Evelyn moved out. Evelyn’s stunned. Tyrone returns home with Evelyn in tow and assures Fiz that they’ve agreed she’ll move out. However when Evelyn points out that she’ll have to go somewhere dog friendly, Fiz suspects she’s playing for time. Tim decides it is time to talk to Sally and Sally tells Gina she is glad Tim is ready to talk, but Gina tells Sally that she shouldn’t meet with him yet as he is still too angry with her. 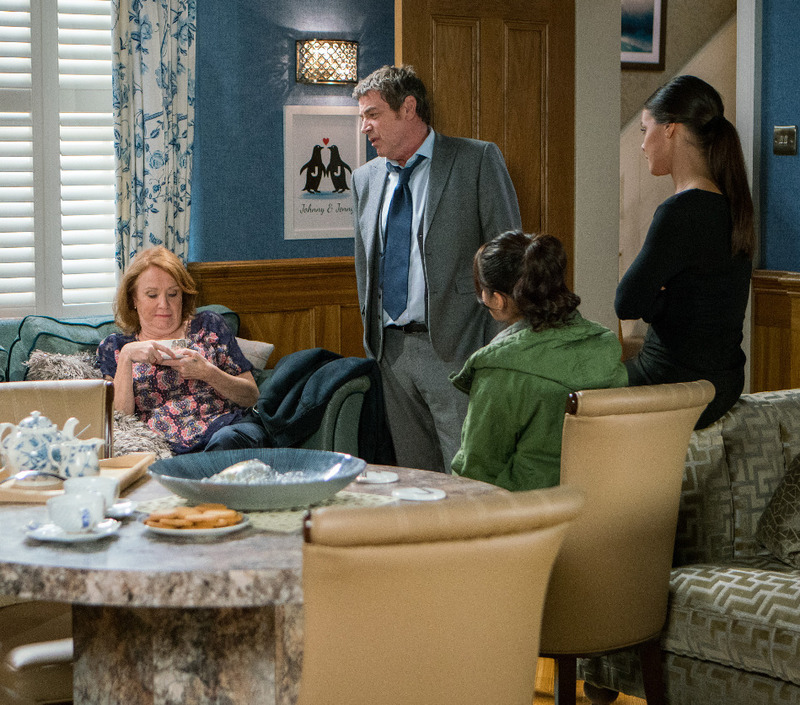 Unaware of Gina’s scheming Tim is upset when Sally cancels their meeting. Kevin is moved to tears when Jack tries his new prosthetic leg and takes his first tentative steps.